Old Testament - Today in Numbers chapter 32 verse 23 we read this strong warning from Moses to the Reubenites & Gadites about their promise to fight with Israel and their desire to settle in the land east of the Jordan river: "But if you fail to keep your word, then you will have sinned against the LORD, and you may be sure that your sin will find you out." I think this is powerful for us to keep in mind in our lives today as well! It's important for us to keep our word! If we're not sure we can keep our word, we shouldn't give it. But if we do give our word, and we fail to keep it, we have sinned. And I do believe the sin will still find us out today. How are you at keeping your word these days? 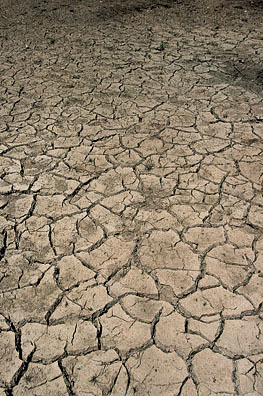 Is there an area of your life where you gave your word and you now are wavering? Can you keep your word in that area? Will you pray to God to give you strength to do so? Let us not be people who fail to keep our word or who stretch the truth! New Testament - In Luke chapter 5 verses 10 & 11 we read - "From now on you'll be fishing for people!" 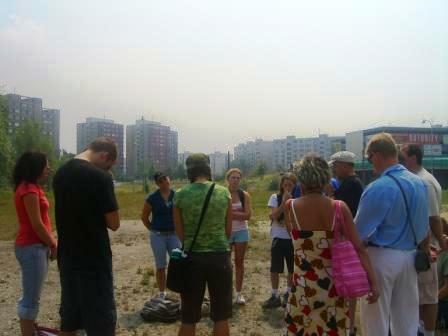 And as soon as they landed, they left everything and followed Jesus." Can you imagine being called by Jesus like this? If you were called by Jesus to stop your "work" that you are doing now and instead work to bring people closer to God, would you do so? Can you imagine yourself today being like these disciples and leaving everything and following Jesus? Bible.org's commentary on Luke chapter 4's readings today titled "Deity Confronts the Demons" is at this link and commentary on chapter 5's readings today entitled "How to Hook a Fisherman" is at this link. 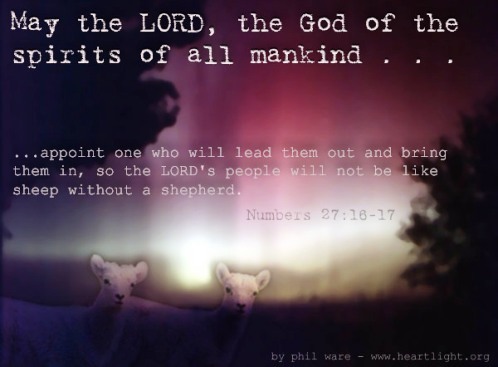 Worship God: Luke chapter 5 reminds me of Steven Curtis Chapman's great song "For the Sake of the Call:"
Will you abandon it all for the sake of the call? Click here for the Call! Prayer Point: Pray that you will follow Jesus. Pray that you will leave everything else in this life that does not line up with Jesus call for your life and for God's glory. 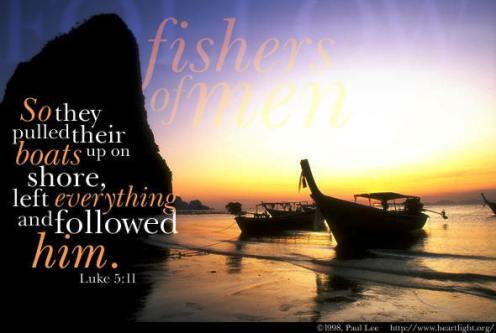 Comments from You & Questions of the Day: Based on our readings in Luke today, do you believe that Jesus still calls his followers to be fishers of people today? Are you a fisher of people? How are you fishing for people for the Lord in your life today? What are some ways that Jesus might be calling you to fish for people today? Also, what verses or insights stand out to you in today's readings? Please post up by clicking on the "Comments" link below! Old Testament - Today in Numbers chapter 30 we read about the various complexities of vows, particularly related to women making vows. (and how their fathers or husbands can void them on day 1, etc.) Apparently the Jewish system and tradition of vows and what counts and didn't count got even more complex over the years between this chapter in Numbers and when Jesus was born. I love that in the Sermon on the Mount Jesus simplifies the whole complex system of vows! Check out Matthew chapter 5 verses 33 through 37 where Jesus says: "“You have also heard that our ancestors were told, ‘You must not break your vows; you must carry out the vows you make to the Lord.’ But I say, do not make any vows! Do not say, ‘By heaven!’ because heaven is God’s throne. And do not say, ‘By the earth!’ because the earth is his footstool. And do not say, ‘By Jerusalem!’ for Jerusalem is the city of the great King. Do not even say, ‘By my head!’ for you can’t turn one hair white or black. Just say a simple, ‘Yes, I will,’ or ‘No, I won’t.’ Anything beyond this is from the evil one." 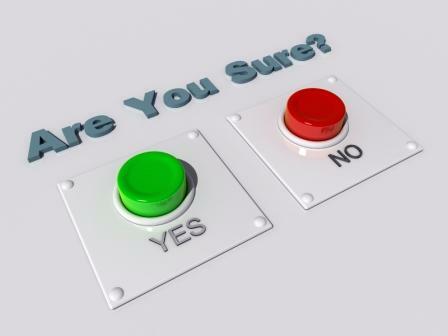 Let's let our yes simply mean yes and our no's simply mean no's! 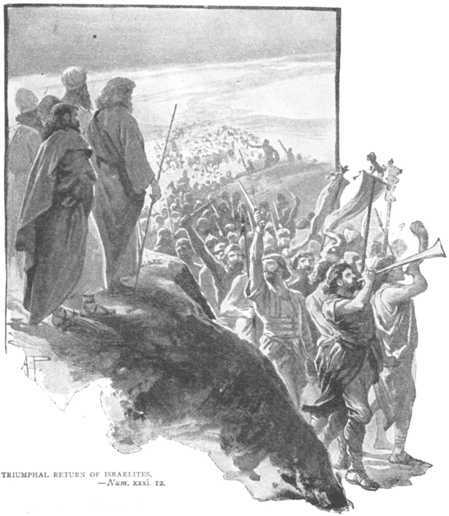 Below is an image for Numbers chapter 31 verses 11 & 12: "After they had gathered the plunder and captives, both people and animals, they brought them all to Moses and Eleazar the priest, and to the whole community of Israel, which was camped on the plains of Moab beside the Jordan River, across from Jericho." New Testament - Today we read about the temptation of Jesus. This is a powerful narrative for each of us to consider. We all obviously face temptations in our life. Jesus faced temptations as well. The difference of course is that Jesus did not give into the temptations. He did not sin. I love the fact that Jesus combated the devil's temptations with the Word of God, the Bible. We each would do well to pay attention to how powerful the Word is in thwarting the devil's temptations of us today. 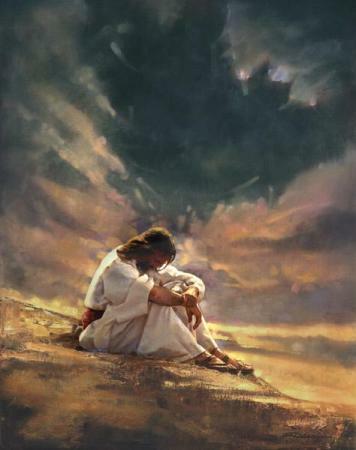 Here's a very amazing image I found below, with a look at Jesus being tempted by the devil. Check out the cloud of temptation above him... the devil. Ever feel this cloud of temptation hovering above you? I know I have... And I know that faith in Jesus, calling upon Jesus' name, and bringing to mind the Word of God in times of darkness & temptation can send this cloud away from us! Bob Deffinbaugh at Bible.org has 4 great commentaries on the temptation of Jesus in the Gospel of Luke at this link, and at this link, and at this link, and at this link. And his look at verses 14 through 30 in Luke chapter 4 titled "On Prophets and Popularity" is at this link. Proverbs - Proverbs chapter 11 verse 20 today teaches us: "The LORD hates people with twisted hearts, but he delights in those who have integrity." I find it interesting that this Proverb talks about twisted hearts. I pray that our hearts are not twisted! If they are twisted at all, I pray we allow God, Jesus & the Holy Spirit, the great surgeons, to untwist us. Only They truly can! Do you want God's rain? Click here for rain! Prayer Point: Pray that your soul is thirsting for God today. Pray that your body is longing for God today. Pray for ultimate and eternal satisfaction in God alone. Comments from You & Questions of the Day: When faced with temptation in your life, have you ever brought to mind the Word of God? Did this change things? Do you believe that the Word of God can help us combat temptation in our life? Also, what verses or insights stand out to you in today's readings? Please post up by clicking on the "Comments" link below! 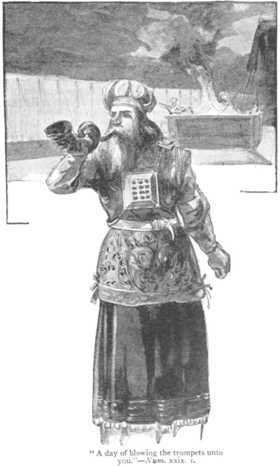 An image is below for Numbers chapter 29 verse 1: "The Festival of Trumpets will be celebrated on the appointed day in early autumn each year. You must call a solemn assembly of all the people on that day, and no regular work may be done." 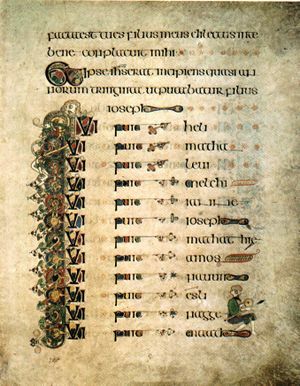 Bible.org's commentary on the genealogy of Jesus is at this link. Proverbs - Today Proverbs chapter 11 verse 18 teaches us: “Those who sow righteousness reap a sure reward." Are you the Body? Click here to meet the Head of the Body! 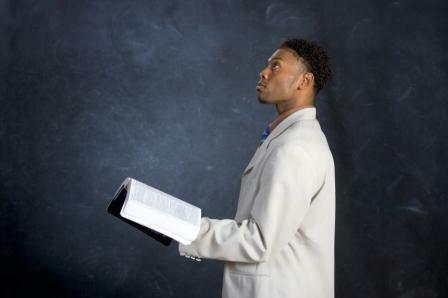 Prayer Point: Pray that you would not rely on your own power, but will rely only on God's power in you. Pray that you will always humbly know that power belongs to God alone. Comments from You & Questions of the Day: Based on our Proverb today, are you sowing righteousness in your life? How are you sowing righteousness in your life? Do you love others at the same level you love yourself? Are you working diligently for your employer? Are you serving the poor? Do you believe that the farming analogy of sowing and reaping in this Proverb is true? And like any good farming analogy, will you patiently sow and patiently await the time of reaping of your sure reward? Also, what verses or insights stand out to you in today's readings? Please post up by clicking on the "Comments" link below! New Testament: I always love reading about John the Baptizer! 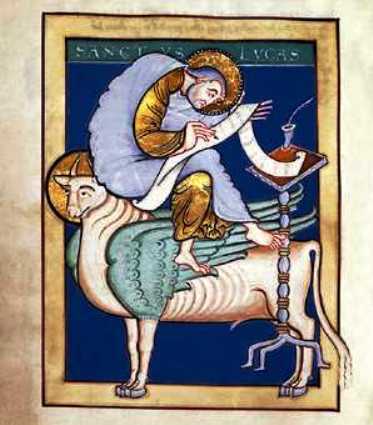 John is sometimes referred to as the "last Old Testament prohet." 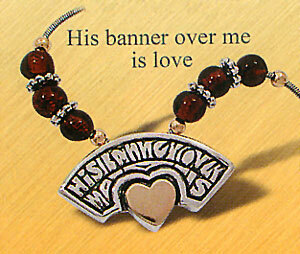 Jesus said this about John in Luke 16:16 - "The Law and the Prophets were proclaimed until John." Jesus is the fulfillment of the Old Testament prophets, priests and kings. I find it very helpful to know Jesus is my Prophet, Priest and King. Prophets in the Old Testament typically preached repentance from sins, and John was no exception to this rule in our readings in Luke chapter 3 today. John preached repentance! Have you repented from your sins? 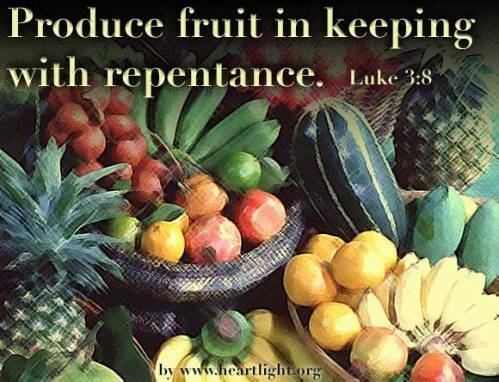 Is your life showing the fruits of your repentance? 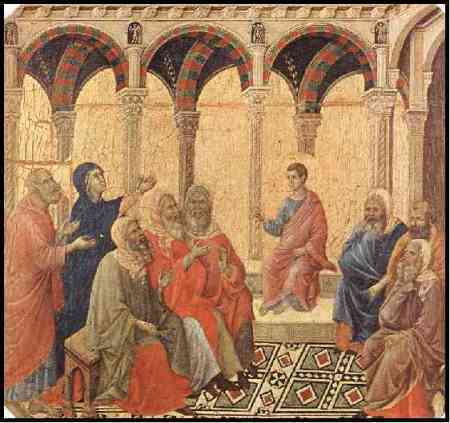 Commentary from Bible.org on Luke chapter 3's readings today titled "John the Baptizer" is at this link. 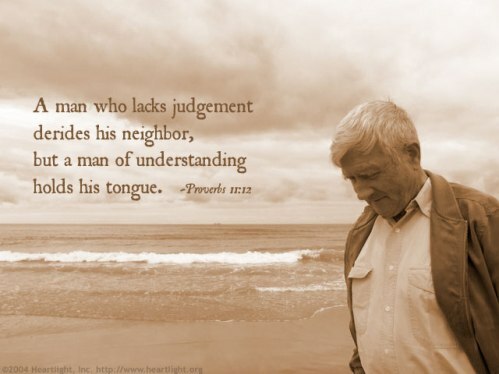 Proverbs: Today's Proverbs remind us to be kind! 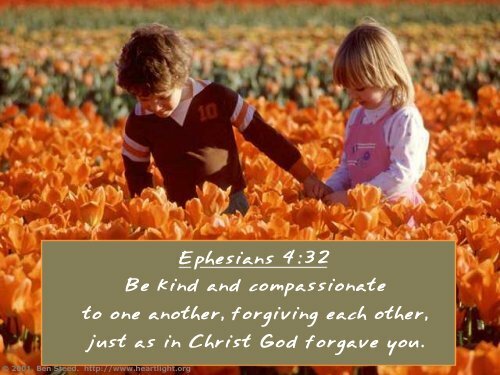 How's your kindness going these days? Worship God: Today's readings in Luke reminded me of Josh Wilson's song "I Refuse:"
Prayer Point: Pray for more of the Holy Spirit in your life. Pray that you life will be pleasing to God. Comments from You & Questions of the Day: Based on our Psalm today, do you cry out to God in prayer during the storms in your life? When your heart grows faint, do you call on God’s holy name, and allow him to lead you to his Rock? Do you believe that God can be your refuge? Your strong tower against the foe? Do you long to dwell in God’s house forever? 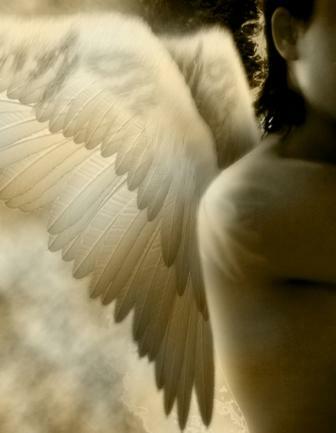 Do you long to take refuge in the shelter of God’s wings? Also, what verses or insights stand out to you in today's readings? Please post up by clicking on the "Comments" link below! Old Testament - Today in Numbers chapter 26 we read about Israel's second census, which was commanded by God. (We'll read later in the Bible a census conducted by David that was not commanded by God, which was a sin.) This 2nd census in numbers was taken approximately 38 years after the first census. 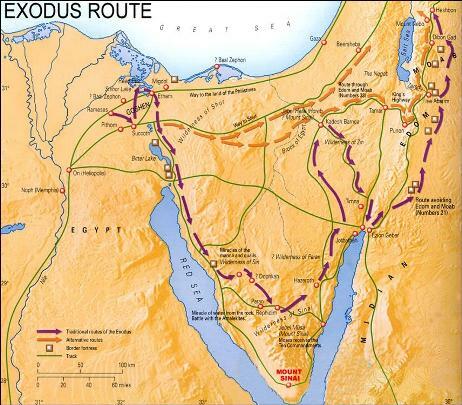 The first census in Numbers chapters 1 & 2 was taken after Israel had left Egypt. This second census is being taken just before the conquest of the Promised Land. In verse 51 today we read: "So the total number of Israelite men counted in the census numbered 601,730." This total of the second census compares to 603,550 from the first census, so is very comparable. These second census numbers obviously reflect the 24,000 deaths we read about in chapter 25 - so this number would have been higher. To me, overall, to see the numbers so similar over 38 years in the wilderness shows that God's hand of blessing was so clearly upon the Israelites. They were flourishing in the desert. Hopefully this is encouraging to us today. If we are in right relationship with God, I believe our lives will clearly flourish in whatever circumstances we might find ourselves in - even if we are in the desert! Bible.org's commentary on today's readings in Luke titled "The Day Jesus went AWOL" :) is at this link..
Proverbs - Proverbs chapter 11 verse 15 is saying one thing - which I get - but for some reason today, something else is being said to my heart. 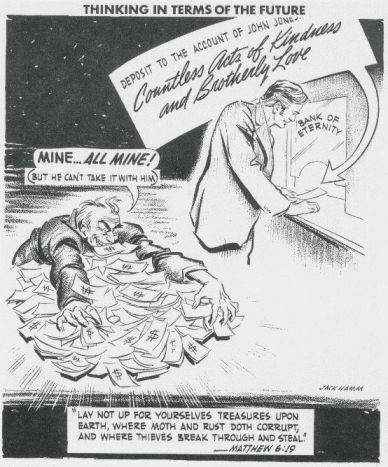 Here's the verse: "Guaranteeing a loan for a stranger is dangerous; it is better to refuse than to suffer later." It's that last half of this verse that is jumping out at me - and in a way unrelated to loan guarantees. :) Here's the tangent this verse brought to mind for me today. I am someone who does not do a very good job of "refusing" much of anything. I say yes to way too much and take on way too much. And part of me really enjoys this - I feel wanted, loved, invited, needed, busy, etc. But then... I suffer later. 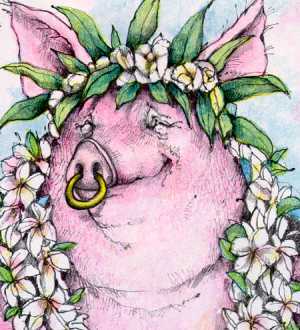 I then feel overbooked, stretched thin, and just plain tired and grouchy. So, for me, the second half of this verse tonight is a good verse on boundaries - it's better to refuse than suffer later.... I like that.... I need that! Do you look forward to living in your Father's big house forever? Click here to meet His Son! Prayer Point: Pray that you will look for Jesus today in his Father's house, heaven, seated at His Father's right hand side in glory. Pray that you won't ever need to search for Jesus, but know that He is with you always, even to the very end of the age. Comments from You & Questions of the Day: Based on my Proverb reflections above, how are you with setting boundaries? Do you know when to say No and when to say Yes? What are some disciplines you practice to make sure you set appropriate boundaries? 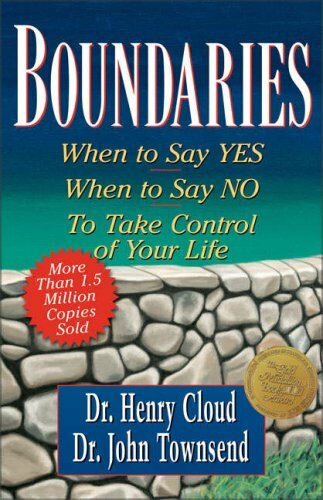 Has anyone read the "Boundaries" book I show above by Henry Cloud? I hear it is fantastic from friends of mine that have read it! 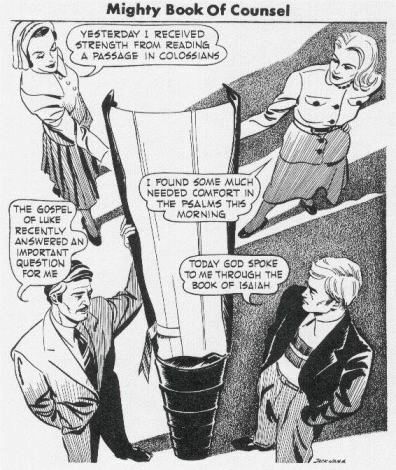 In fact, I heard it's great for small groups too. May be just what the doctor ordered for me... Also, what verses or insights stand out to you in today's readings? Please post up by clicking on the "Comments" link below! And just when it looks like Balaam was turning out to be maybe not so bad in chapter 24... we get to chapter 25... In chapter 25 we read about Israel's sin in worshiping Baal and their sexual immorality. What we don't find out until Numbers chapter 31 verse 16 is that Balaam was the principal instigator of the idea of leading Israel toward this sexual sin & idolatry: "They were the ones who followed Balaam's advice and were the means of turning the Israelites away from the LORD in what happened at Peor, so that a plague struck the LORD's people." 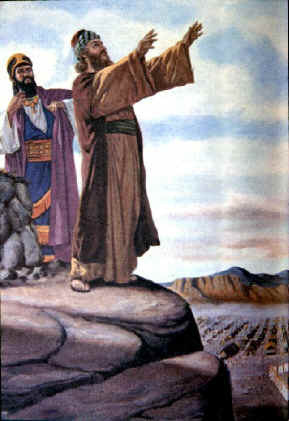 Revelation chapter 2 verse 14 also refers to Balaam's hand in the incidents that took place: "Nevertheless, I have a few things against you: You have people there who hold to the teaching of Balaam, who taught Balak to entice the Israelites to sin by eating food sacrificed to idols and by committing sexual immorality." Reading about these incidents in chapter 25 today - do you think people today still live in this tension of serving God versus being seduced by idols? What saves us from this tension? Bob Deffinbaugh's take on Chapter 25 and Balaam's behind the scenes work is at Bible.org at this link and leads off with, "Balaam’s Advice: “If You Can’t Beat ‘Em, Join ‘Em!”" is at this link. 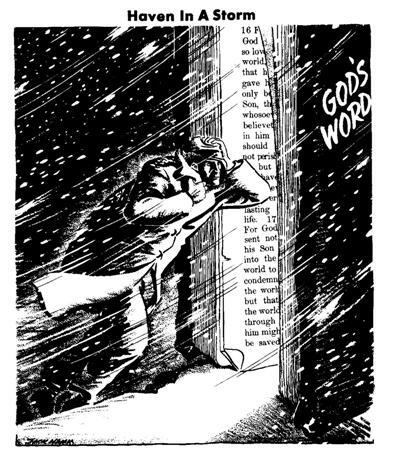 New Testament - Okay, any fans out there of Charlie Brown's Christmas Special recognize anything here from Luke chapter 2?? 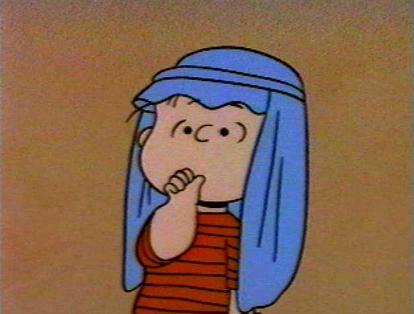 :) Yes, indeed, Linus' speech to Charlie Brown about the meaning of Christmas comes straight from the KJV of this chapter, Luke 2:8-14. Great speech Linus! Bible.org commentary on Luke chapter 2 titled "The Birth of the Messiah" is at this link, and "Acclamations of the Birth of Christ" is at this link. Do you know the true meaning of Christmas? Click here for your Christmas today! Prayer Point: Pray that you will treasure all of the Words of Scripture that you are reading this year and that you will often ponder the Word in your heart. Comments from You & Questions of the Day: Based on our Proverb today, do you have advisers in your life today? Are there times that you try to figure things out just on your own rather than consulting advisers? Which way works better? Has the counsel of advisers in your life ever changed how you might have approached a situation on your own? If you don't have advisers in your life, do you think you should? Where do you think you can find wise advisers these days? In church? In a small group? In a Bible study? Also, what verses or insights stand out to you in today's readings? Please post up by clicking on the "Comments" link below! Bible.org commentary on Balaam in chapters 22 & 23 is at this link. 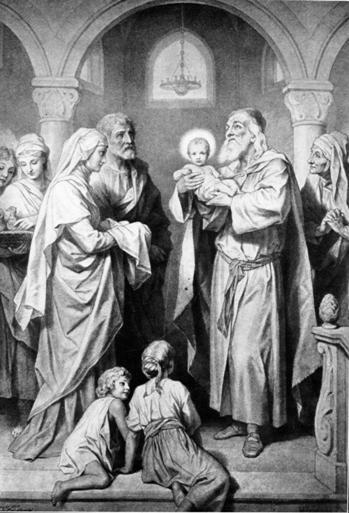 Bible.org's commentary on our readings in Luke today titled "Why John Was Not Named 'Little Zach'" is at this link. YouTube - Today's Psalm reminds me of the Matthew West song "Only Grace:"
Have you experienced God's grace? Click here for Grace! Prayer Point: Pray that you will trust God completely. Pray that you will see God's promises made and promises kept in the Bible this year, and in your life. Comments from You & Questions of the Day: Based on my reflections in Numbers today, have you ever had any "talking donkey" experiences in your life? An experience that at first glance was a huge inconvenience to you, but in retrospect was an incredible blessing from God? Basically, have you ever had a blessing in disguise? Do you think God still can use "talking donkey" experiences in our lives today to get our attention? Also, what verses or insights stand out to you in today's readings? Please post up by clicking on the "Comments" link below! 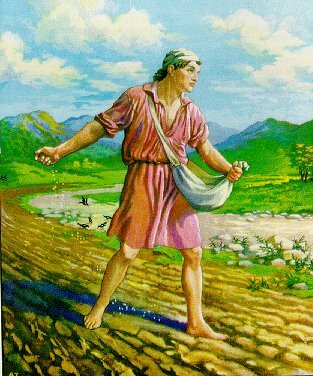 Old Testament - Today in Numbers chapter 22 we read about Balak sending for Balaam - hoping Balaam will curse the Israelites. Balak sends messengers the 1st time and Balaam gets a message from God to not go with these messengers, as God has blessed the Israelites. What is interesting to me are verses 15-17: "Then Balak tried again. This time he sent a larger number of even more distinguished officials than those he had sent the first time. They went to Balaam and gave him this message: "This is what Balak son of Zippor says: Please don't let anything stop you from coming. I will pay you well and do anything you ask of me. Just come and curse these people for me!" For some reason these verses really reminded me of temptation in our lives today. Like Balaam with the messengers on their first visit, we may realize something is not what God would want us to do - and we send the temptation away. But... then the temptation can come back! In a bigger way - with more distinguished officials than before... with more allure than before... the temptation that we resisted once so valiantly can come back. And then, the question becomes - with the opportunity to be "paid well" by the temptation, will we still resist the temptation? Can we resist the temptation a 2nd time? 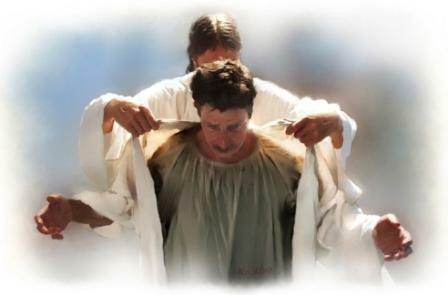 Through Jesus, our mediator before our Heavenly Father, yes, I know we can. If temptation has visited you once - or twice - or even many times - will you pray to God today in the name of Jesus that temptation will never overcome you? 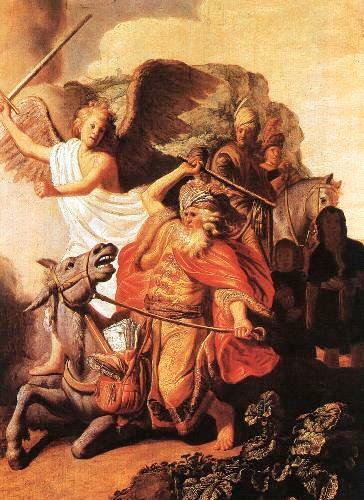 Bible.org's commentary on Balaam and Numbers chapter 22 is at this link. Bible.org's commentary on Luke chapter 1 titled "The Worship of Two Women" is at this link. 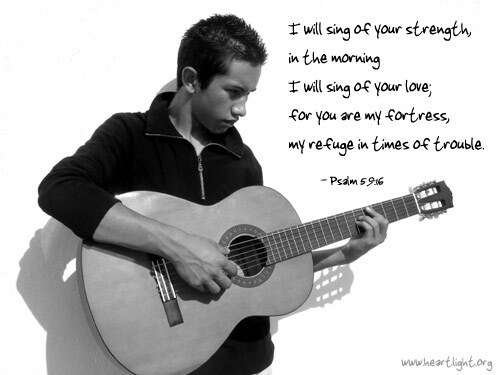 Psalms - Psalm 57 verse 8 is amazing - "Wake up, my soul!" What 4 great words. . . wake up my soul! Do you ever feel like you need to say this to your soul? I know that I have in my past. There have been times in my life where I have felt spiritually asleep. Just completely slumbering. . . and I have begged my soul to wake up! Fortunately, I finally learned that I could not wake up my soul on it's own. I needed the Father, the Son, and the Holy Spirit to wake up my soul. . . and the Spirit keeps it awake today. If you feel that you need your soul to wake up, will you prayer to the Father, Son, and Holy Spirit to indwell your soul and to wake it up? Proverbs - Proverbs chapter 11 verse 11 today teaches us: "Upright citizens bless a city and make it prosper." This is a great reminder to each of us to be good citizens and to bless our cities! YouTube: Proverbs 11:11 today reminds me of fantastic Bluetree song "God of this City:"
Have you met the God of your city? Click here and meet Him! Prayer Point: Pray for your city. Pray that you will be an upright citizen in your city. Pray against wicked talk. Pray that everyone in your city will come to know Jesus, and will enter the heavenly city of Jerusalem one day. Comments from You & Questions of the Day: Based on our Proverb verse above, are you striving to be an upright citizen blessing your city and helping to make it prosper? What are some ways that you are doing so? Do you see spiritual issues in your city today? How are you helping to right those spiritual wrongs in your city? Do you pray for your city regularly? Do you think you should? Will you join me in praying for our cities? Also, what verses or insights stand out to you in today's readings? Please post up by clicking on the "Comments" link below! Old Testament - Today in Numbers chapter 20 verse 12 we read about God pronouncing that Moses & Aaron would not enter the Promised Land - "But the LORD said to Moses and Aaron, "Because you did not trust me enough to demonstrate my holiness to the people of Israel, you will not lead them into the land I am giving them!"" Why did this happen? Well, it's best to stick with Scripture - God says that Moses & Aaron did not trust God enough. They did not trust God enough to demonstrate his holiness to the people of Israel. Thus they will not lead them into the Promised Land. Where was the lack of trust? Go back to verse 8 and you'll see God tell Moses to "command the rock" for water - command meaning verbally... then in verse 11 we see Moses strike the rock twice - not using the verbal command God instructed him on, but using an action. There also may have been a pride issue when Moses in verse 10 says "must we bring you water from this rock?" You'll notice the little word WE - We being Moses & Aaron? 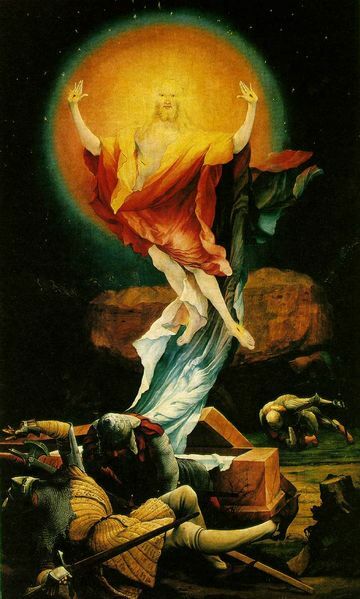 -this is probably not the way to best recognize God for God bringing water out of the rock... It looks like Moses is taking credit. How about us in our lives today? Are there times when we disobey God's direct commands to us? Are there times when we take credit for God's work? Even if we generally follow God's instructions - as Moses clearly does for the majority of his life - should we be on constant watch that we do not disobey God? New Testament - Today we begin the Gospel of Luke! Content: Luke was a physician and a traveling companion of the Apostle Paul. He wrote his Gospel for a cultured Greek named Theophilus in order to show the true humanity of Jesus and his place in history. For this reason Luke was careful to examine all the evidence very carefully and give precise dates for the events that took place. 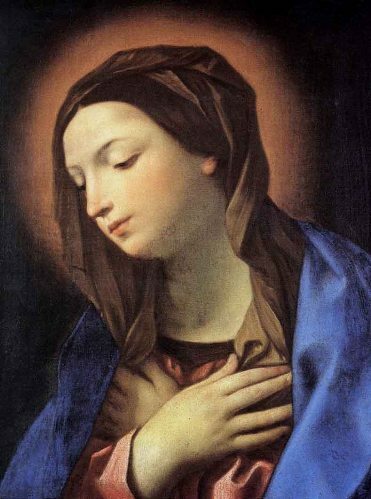 He begins with an account of Jesus' virgin birth, giving many details not found elsewhere. Jesus' Galilean ministry is described, followed by a lengthy account of Jesus' trip to Jerusalem. After Jesus' death and resurrection, the disciples are left rejoicing, waiting for the promised power of God from heaven to fill them. Proverbs - Proverbs Chapter 11 verse 8 today teaches us: "The godly are rescued from trouble, and it falls on the wicked instead." This is a great reminder that God rescues those who trust in Him! Worship God: Today's readings in Numbers 19 reminded me of Nicole Nordeman's song "Holy:"
Are you pursuing holiness in your life? Click here and cry Holy! Prayer Point: Pray that you, like John the Baptist, will live a life that brings many people back to the Lord. 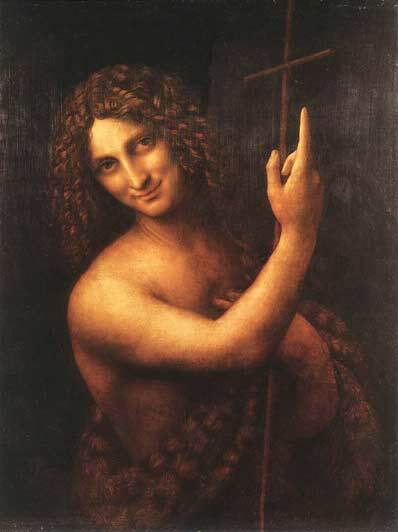 Pray that you will be as zealous for God as John the Baptist was zealous for God. Comments from You & Questions of the Day: Based on our Proverb today, has God ever rescued you? More than once? Are you willing to share with us in the Comments section below a time that without a doubt God rescued you? Also, what verses or insights stand out to you in today's readings? Please post up by clicking on the "Comments" link below! 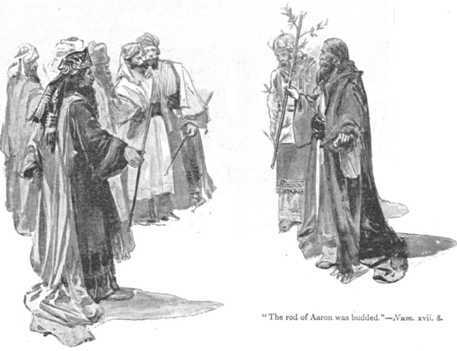 Old Testament - Today in Numbers chapter 17 verse 8 we read how God stopped the questioning of the Israelite community about Aaron and his houses' unique priestly authority - "When Moses went into the Tabernacle of the Covenant the next day, he found that Aaron's staff, representing the tribe of Levi, had sprouted, blossomed, and produced almonds!" The 2nd sentence in Numbers chapter 18 verse 20 stood out to me today: "And the LORD said to Aaron, "You priests will receive no inheritance of land or share of property among the people of Israel. I am your inheritance and your share." What a beautiful thing to hear from God! I am your inheritance and your share. In your life today, is God your inheritance and your share? Do you want God to be your inheritance and share? Does anything else at all compare to this glorious inheritance? Bible.org's commentary on yesterday & today's readings in Mark titled "A Follower's Opportunity" is at this link. 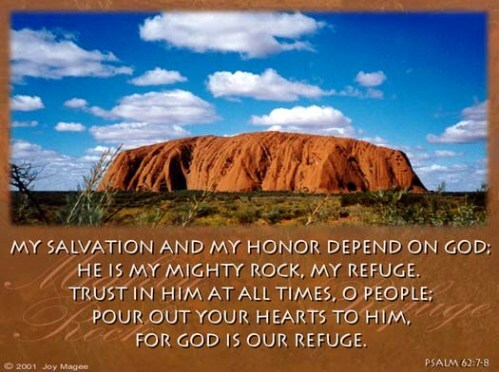 Psalms - Today we read Psalm 55 verse 22, which is a beautiful reminder to all who believe in the risen Lord! 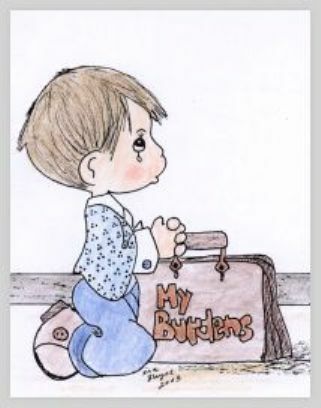 "Give your burdens to the LORD, and he will take care of you. He will not permit the godly to slip and fall." Please do meditate on this verse a bit. Do you make it a habit of giving your burdens to the Lord? Or do you try to carry your burdens on your own strength? Is there a burden you are carrying today that you can give to the Lord? Will you? And do you trust that he will take care of you and not permit you to slip and fall? Proverbs - Proverbs chapter 11 verse 7 today teaches us: "When the wicked die, their hopes die with them, for they rely on their own feeble strength." This is a great reminder of why we should not only not carry our burdens on our own, but we should also not rely on our own strength. Our strength is fleeting... Will you instead rely on the Eternal Strength that will never fail you? Worship God: Psalm 55:22 above reminded me of the fun but great message song by MercyMe called "So Long Self." Enjoy! Have you said "so long self?" Click here to meet your true Self! 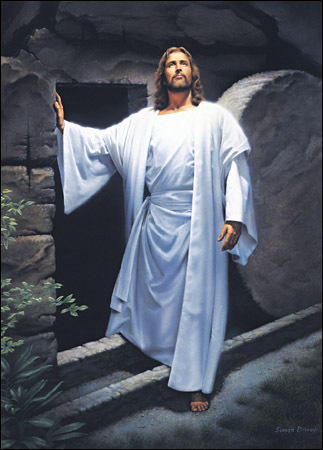 Prayer Point: Pray that you will know truly in your heart that Jesus is risen and that He sits at the right hand of the Father until he comes again in Glory. Comments from You & Questions of the Day: Based on our Proverb today, have you seen in your life how your own strength can fail you? 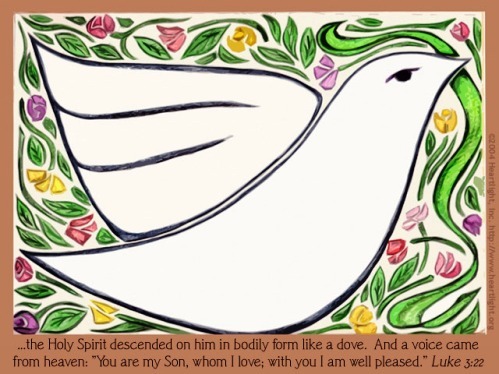 Have you ever been strengthened by the Holy Spirit? How are you able to discern when you are doing things from your own strength compared to when you are being strengthened by the Holy Spirit? 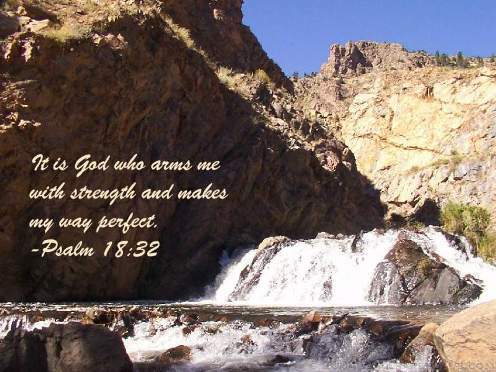 How do you surrender your own strength and instead rely on God's strength? Also, what verses or insights stand out to you in today's readings? Please post up by clicking on the "Comments" link below!